Hey all! I'm finally posting my address subway art project, from my Gallery Wall! Sometimes that happens with projects... right!? I think in this case, it was a blessing in disguise... because I LOVE the way this over sized subway art turned out, on just this simple piece of plywood! 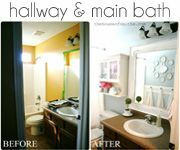 If you use flat paint, know that it will appear darker when you first apply it, but once it dries, it lightens up quite a bit. In this picture, you can see how the gray paint is starting to dry over the first black coat, from before. After the coat of gray was totally dry, I applied my large piece of negative space address vinyl, that I designed, to the board like so. Normally I would have just used the actual vinyl on the board, but I wanted this sign to look a lot more distressed and worn looking. So I decided to use the vinyl as a stencil, instead. A little bit of the edges of the board were exposed, so I just taped up the parts that were showing, so that I wouldn't get paint on them. Then I took a foam brush, with some semi-gloss white paint, and pained over the whole vinyl decal. It took about 4-5 coats, before I felt like I got really good coverage. I then used a VERY technical tool, to speed the drying process along. hee hee :) works EVERY time! After the paint was MOSTLY dry, I peeled off the vinyl. You don't want to wait TOO long before doing this step, because if your white paint is thick (like mine was, after a bunch of coats) and then you try to peel your stencil off, it may peel up some of the paint with it. Mine really only took about 10 minutes or so to dry, before I peeled off the vinyl. But since the paint was still a bit tacky, I used small tweezers to take out the insides of the letters. Okay... so this is what you will end up with. After that, I started the final sanding process. I used my mouse sander again... but CAREFULLY this time. Going only in up and down motions. If you start going back and forth, OR in circles. EVERY sanding stroke WILL show up... because you have that black underneath. I haven't put anything over the entire board yet, but I'm thinking just a quick flat clear coat will suffice, to seal it all up well. This is what you'll end up with!!! We love this piece SO much! It really means a lot to us. And it reminds me often when I look at it, of the first part of our journey that we've taken as a family, thus far, in our lives. She was the first (that I know of) to jot down all her addresses and put them into Subway Art form! Dang that girl is good. Thanks for the idea, girly! And yes, these are the places where we have lived, so far in our lives, as a family. But I switched everything up. So, the coordinateness are not matching, as you read down the list. 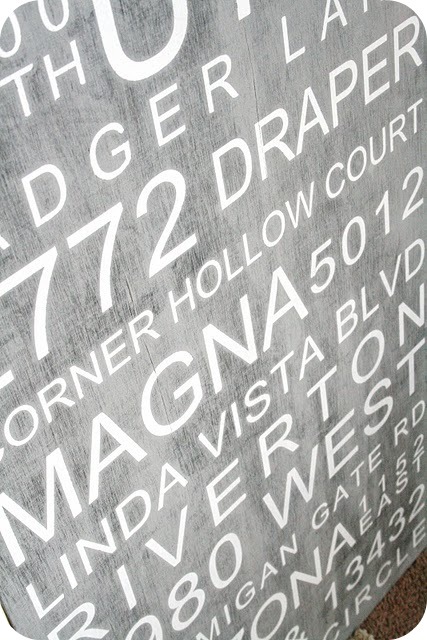 I liked it better this way, but you could totally design your own to have your addresses all read out correctly. Also, I didn't include zip codes. 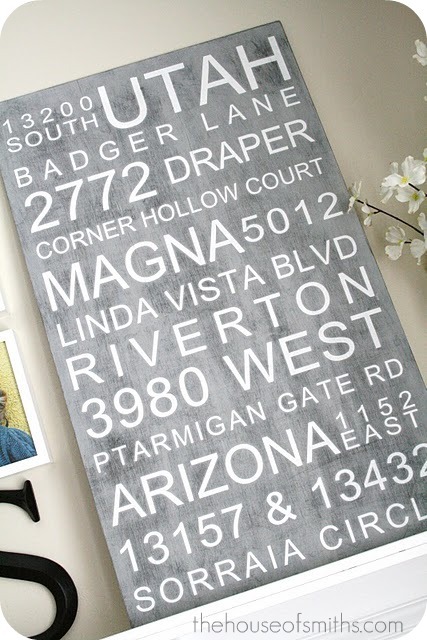 But if you haven't lived in lots of places, and you want to fill the board up more. Those would be great space fillers! "I've lived in the same place my whole life, I love this idea, but would have nothing to put on my board!" I was thinking about this, and I thought that if you still wanted a fun subway art board like this, you could maybe put down the places that your family has visited or vacationed! Pretty much anything on the board would do. But I like the idea of just listing things, and also the sentiment that it brings, when it's places that mean something to your family . Third...I've already had a bunch of readers ask me if I am going to be creating address subway art decals for customers from my Design Shop... and unfortunately, I'm not. So sorry! I've taken a vow to cut way back on custom orders, due to all the time that it takes away from my little chicks and hard workin' hubby. BUT, this project could TOTALLY be done with a Silhouette if you have one! 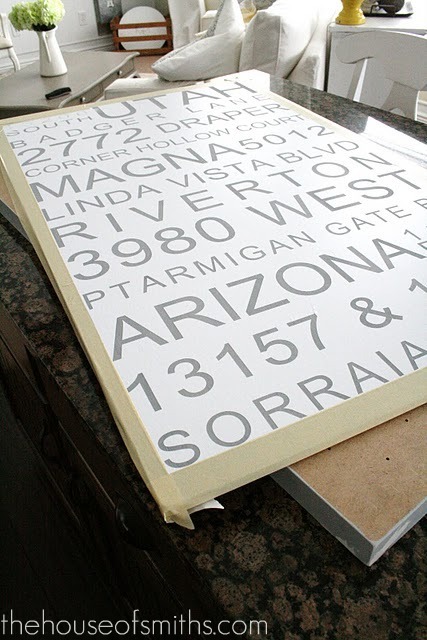 Just print out your addresses in strips, take out the negative vinyl, and lay them down, so they piece all together! The font I used for my subway art was called Arial Unicode MS. 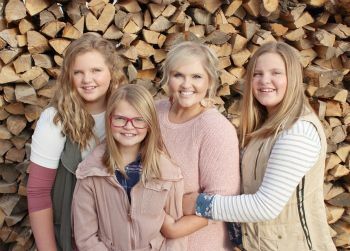 I'm not sure if Dee is taking custom orders right now, but if not... you'll still just LOVE all of her pre-made boards and canvases. GORGEOUS! You are my idol...you rocked this project! As always...! Thanks so much for the inspiration, Shelley!! I love this sign. It's beautiful - and such a creative way to showcase your family's journey thus far. I may have to make one myself! I love it SOOO much! It seriously looks professional! Okay this may be a stupid question but did you cut this with your silhoutte machine and if so how did you get it that wide? I'm a new owner of one and a bit confused on how to use it. I love love LOVE this and am so glad that you did a tutorial for it! 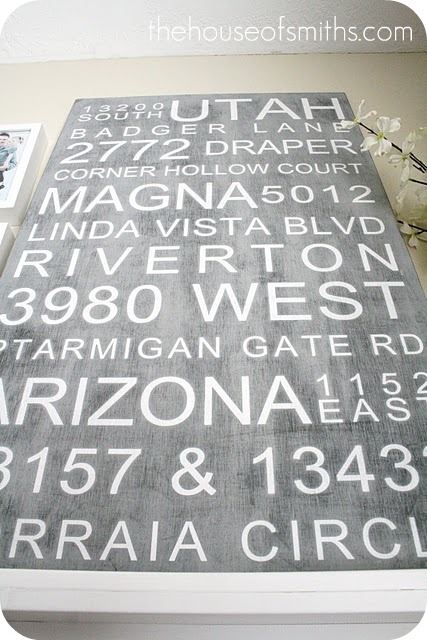 It looks like there are a lot of steps to it, but I might just have to try to make one myself! I love this! I have wanted to do something similar for forever... with meaningful places to us. 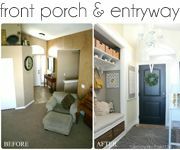 I love this idea though of all of your homes! So beautiful... thanks for the tutorial. I absolutely love it! If someone wanted this and compiled a list of their addressed for you would you be able to create a similar vinyl for them. . . and when I say them I mean me. That is really neat! I like the idea of doing something like it with places we've travelled to. This is awesome! Love this idea. I don't have a Silhouette but have been thinking of getting one. what a fun project! 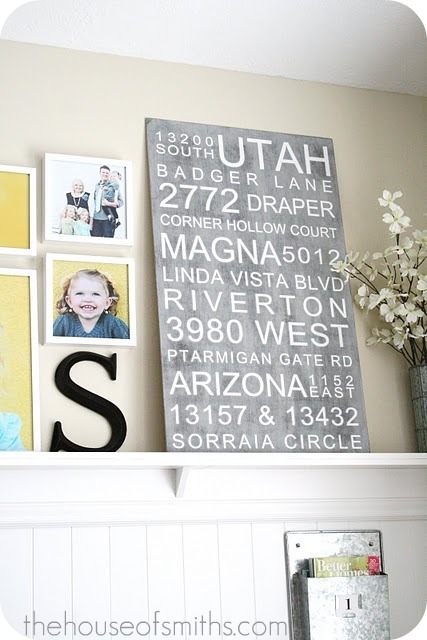 I might need a BIG board to do this because I've lived in a lot of places! he, he!! Great job, it looks fab in that gallery! Love it!! I would love to make something like this. Wow. That is so great...I really want one! I am moving (sadly) so I might need my old address somewhere for sentimental reasons. What a great idea. 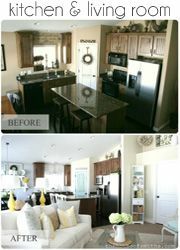 And, I LOVE the yellow/gray color scheme. You are so talented. OK I just found your blog like 4 days ago via Pinterest, I'm not even kidding you, I've had your site open on my browser ever since going through your old posts (literally, ONE by ONE I'm on 10.03.10). I have to say reading through all your projects backwards is pretty fun ;). Can I just BE you when I 'grow up'? Pretty please?! You're so talented and amazing. Thanks for all the great ideas and inspiration. Love the subway art, that's my favorite decoration item lately. shelly, can you find me the best deal on the silhouette machine? i am ready to get one and i thought you might could give me the "hook-up"! thanks in advance!!! I sure do wish I remembered all of my old addresses now. I love this project. Well Done!! Thanks for such an awesome tutorial! This would make an awesome anniversary gift for a couple that's lived several different places. Love the idea of using vacation locales, too. Great job! I noticed this board when you first posted photos of this wall and added the project to my never ending to do list. Thank you for the step by step, that will help a lot!! this is SO beautiful! I'm glad that after all the fail & redo, it's turned out more amazing than imagined. Hello! So Emilie is a dear friend (photo by emilie) and she put me onto your cute blog, and oh my word girl, I LOVE it!! 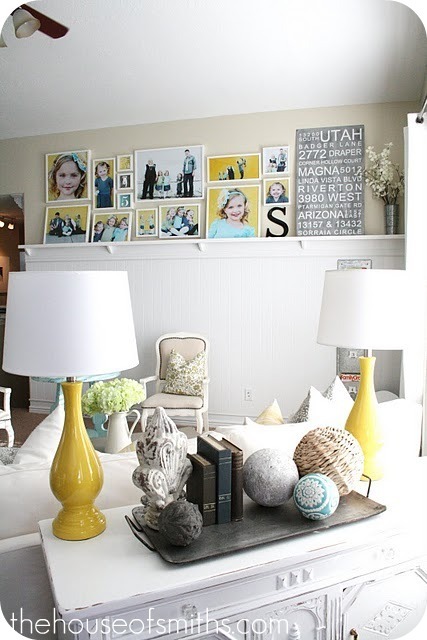 This photo wall with the ledge, beadboard, matching pops of yellow, offset with the clean white, and cute decor... is just magnificent!! GREAT JOB!!! You are seriously a genius!!!!!! You are!!!!!! I'm new to your site (stumbled upon b/c of someone else's blog that mentioned your photo wall). That was the first post that I saw and I too LOVED your subway art. A very neat idea b/c we have also had a number of addresses. I am so in GLAD, HAPPY, ECSTATIC that you documented the process on HOW TO create that great looking piece of ART! It amazing, you took pictures of every step and documented it for those of us who would love to recreate it....THANK YOU so much! I've never done anything like this but now I think I can b/c you've shown how to do it.....really THANK YOU! Awesome, so happy you put a step by step on here for us! It looks great! What machine do you have that cuts such large pieces of vinyl? I'm drooling with creativity! Super cute..I have been seeing this on several post in the background and wondered how you did it! Thanks for sharing the HOW TO...looks great! I love this great project! Thanks so much for linking it up to Fab Friday at Faith, Trust, & Pixie Dust! I love this! I decided to make one for my local high school. It turned out great. thanks for the inspiration!! 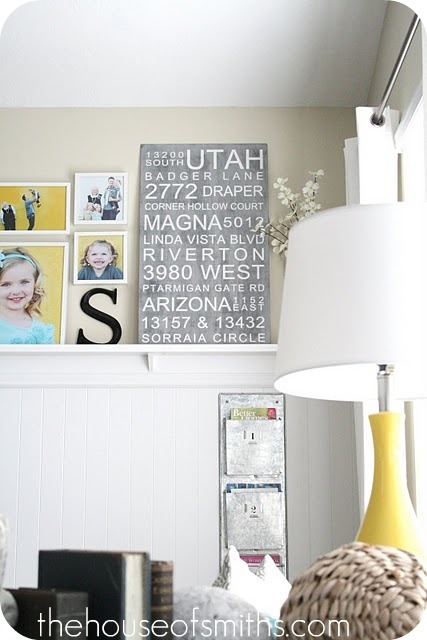 I absolutely love the sign and the gallery wall. It looks gorgeous!! This whole space is gorgeous. This is fabulous! I have been wanting to try this. I love the pops of yellow in your photo collage and your lamps. Everything looks great! Bre-Try ebay or googling it.. DOES anyone know if we don't have the machine to print how what else we could do or where we could get one made? LOOOOOOVE it!!! 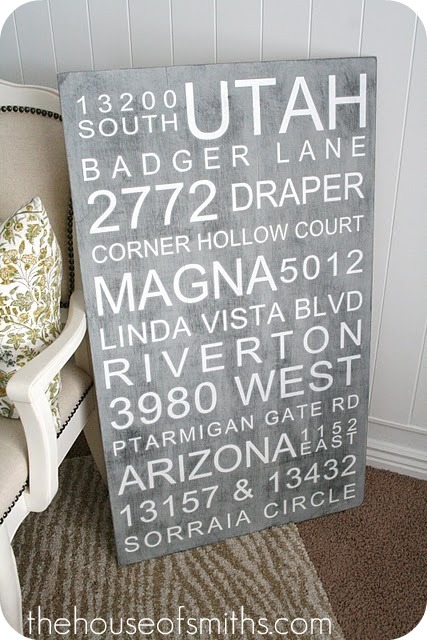 I am dying to make one of these! And whose nails can stay looking so fabulous when they are painting and working and electric sander!? We are faithful followers! I was just wondering, Do you print the vinyl yourself? if so how would I go about that? where do you make your vinyl stencils? great ideas for other versions. I love signs of all types! I've seen a lot of different forms of subway art and this is by far my favorite! You are so creative! And the fact that you used adresses that so far, so personal. Love it! How did you cut the vinyl so big? What machine do you have?? Not the silhouette clearly :) fab work! I was sooooo excited to see how you did this...but I forgot you have VINYL!! Poo...I don't have a way to get my hands on that right now. =( But REGARDLESS...it looks AWESOME! I have sign envy =) I have a song chorus I'm wanting to put on a big board like that for my son's room (or my living room...can't decide =) but I need to figure out a cheap way to do it. =) Anywho...sorry for the rambling. ;) All THAT to say - it looks GREAT, and what a BRILLIANT IDEA! ;) Tehee! Yay! I found it! (Just asked about this on your gallery wall post...) I am super excited to try this one out. Thanks for sharing! What machine do you use for your vinyl? LOVE THIS! What machine did you use for this? I just made something like this for myself. I created mine in photoshop and ordered it as a large photo print mounted to foam core. Ours is a list of the vacations we have been on from our honeymoon in 1999 until now. It came out cute and I love it. I used sticky strips to mount it to the wall, no frame or anything :) If you were into spending a little more money, you could certainly order it as a gallery wrapped canvas. We haven't been anywhere all that amazing, but it's cute nonetheless. WOW you made my day by linking up to my things I love series! :) THANK YOU! Happy Holidays! where do we find the vinyl silhouette? do we have to have a machine? LOOOVE your stuff by the way! 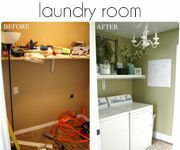 !Found you via your pantry makeover!!! Thanks for sharing it all with us! How did you make the stencil? Great tutorial with wonderful pictures! Love it!!! Yes! I would love to know how to make the stencil/vinyl piece. She has a silhouette cameo machine - it is used to make 12 inches wide by up to 12 feet long vinyl cut outs. Wow...I just came across your blog from Pinterest. I absolutely love your address board. What a super cute idea...TFS!! I absolutely love this idea! I think my kids would have fun looking at it too since three of them were born in different places. I can already hear them saying, "That's my address!" I'm pinning this because I don't know when I'll have time to do it. I'm very impressed by yours! Great idea. It looks really nice in your home with the yelliow!!! I have a completely bizarre question, but I am in love with your metal file holder that is below the sign. Where did you find that gem? I love it and have been looking for ANYTHING similar for ages now. I would love to hear from you about it. Thanks! I just came across your blog... It was crazy for me to see your subway art. I've lived in 3 of your same towns. Small World! This is such a fantastic project... Thanks so much for the inspiration! So excited to get started. A good way to remind yourself of all those past addresses is a credit report or documents from your taxes. :) ... just an idea I had because I cannot remember all of those addresses either! I adore this!! Since we're an Army family and have had 9 addresses in our 9 years of marriage, I wanted to do some subway art with all of our old addresses. I searched Pinterest and came across your tutorial. Thanks so much for posting this!